Director and producer Ken Burns has called national parks “America’s Best Idea”. If that is true, then Yellowstone is the first example of that idea. In 1870, a group of citizens, after a tour of the area, first discussed the idea of setting aside the area as a national park. In 1864, the state of California had asked Congress to set aside Yosemite Valley and the Merced Grove area as federally-protected areas; Abraham Lincoln signed the bill, and two years later it became a preserve run by the state of California. The group of prominent citizens, mainly from Montana, proposed going all the way, and making the Yellowstone area a National Park, the first of its kind in the world. In the 19th century, Niagara Falls had provided a cautionary example for natural wonders. It had reached the point that tourists in that area had to pay one land owner or another just to catch a glimpse of the falls. Price gouging abounded, and too often poor food and dubious accommodations awaited tired tourists. No other national park, in our opinion, can match Yellowstone for outright diversity of natural attractions. It has the greatest number and variety of geysers, hot springs, mud pots and the like. Wildlife: Lots, even if they aren’t always where you would like them to be. (More on this later.) Waterfalls? Lots of them, too. Canyons? Yes, including one very Grand Canyon of Yellowstone’s own. Mountains? Everywhere you look. Most of Yellowstone is on a plateau, at over 7,500 feet elevation, and it is ringed with mountain ranges in every direction. History? Yes, the world’s first national park has a lot of history scattered here and there, from historic buildings to relics of tribes passing through the area. For those who love hiking and backcountry wilderness, Yellowstone has about 1,000 miles of trails. There are lakes and geyser basins that can only be seen by getting off the road and onto the trail. One ranger station in the southeast corner of the park is reached only by hiking (or riding horseback) over 35 miles of trails. The sheer size of Yellowstone will impede a quick viewing of the park. Driving from the North Entrance to the South Entrance covers 100 miles; a trip between the East Entrance and the West Entrance is 80 miles. Typically, major attractions are 15 to 25 miles apart. Maximum speed limits through the Park are 45 MPH – slower near attractions and villages. Traffic jams caused by construction or (much more likely) wildlife near the road will slow you down. Plan on averaging only 30 – 35 MPH, maybe less. Yellowstone is so large and diverse, it must be broken down into sub-sections to properly approach seeing it. For the entire western side of the park, the primary draw are the thermal features. Most of the geyser basins are in this area. The western side also has mountains, lakes, waterfalls, and canyons, but the geysers, hot springs, terraces, and mud pots are the main draws. On the east side of the Park the most popular destinations are the Yellowstone Lake area, the Canyon area, and the Tower Falls/Roosevelt Lodge area. At the extreme north end of the park you will find the lowest elevation in the park. 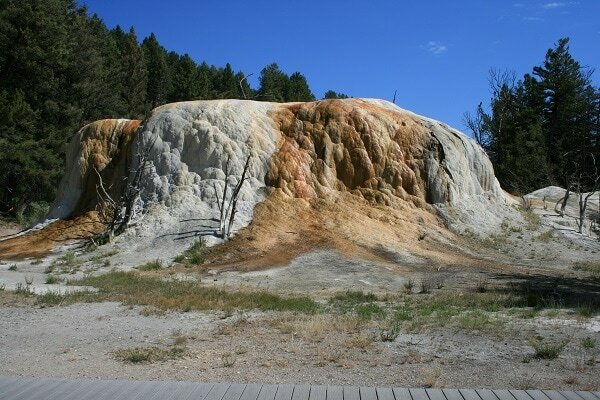 The park headquarters is located there at the Mammoth Hot Springs area. The road system through Yellowstone follows a sort of block-y figure “8.” Access roads connect in from the north, south, east, west, and northeast. 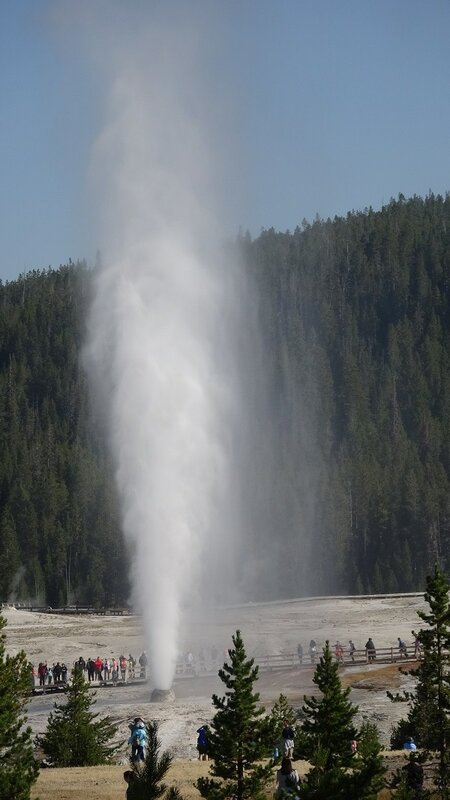 Many tourists start their visit with a trip to the geyser basins. The farthest south is Upper Geyser Basin, named because it sits at about 8,000 feet above sea level. 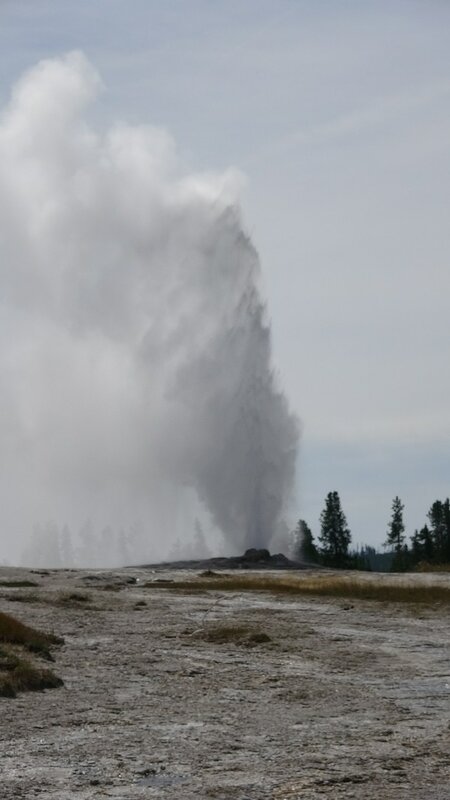 Old Faithful, Grand, Giant, and Castle Geysers are all in the Upper Basin. The Visitor Centers at each location will have estimated eruption times for many of the geysers. The beautiful Firehole River flows alongside many of the thermal features. 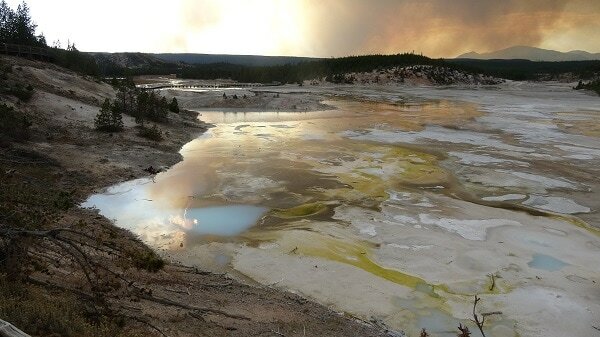 A few miles north of the Upper Basin is Midway Geyser Basin. The most prominent feature at Midway Basin is Grand Prismatic Spring. Grand Prismatic is a massive brilliant blue hot spring that is rimmed by brilliant yellow, orange, and red algae deposits. 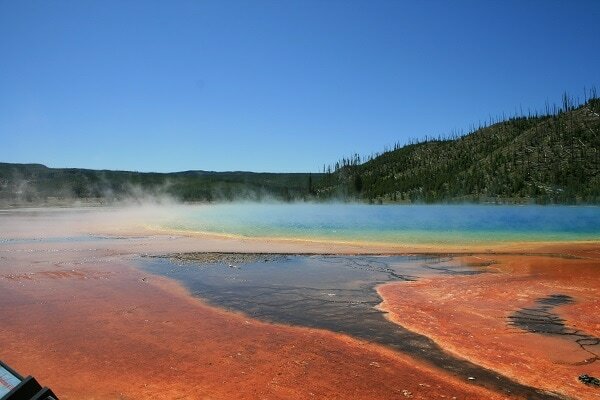 A little further north, the Lower Geyser Basin has geysers, hot springs, a hot lake and mud pots. Great Fountain Geyser is probably the most photogenic geyser, with its pools and terraces reflecting the mountains and sky. 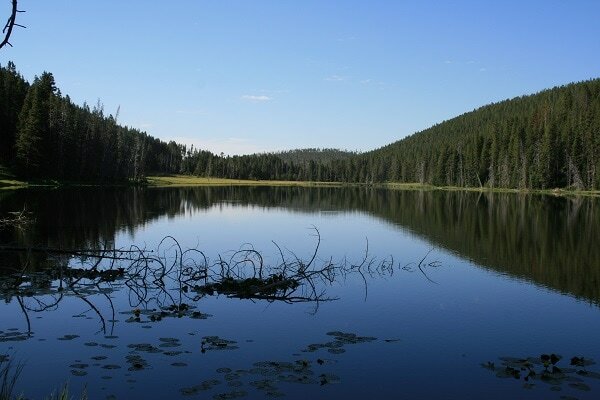 Near Lower Basin is Firehole Canyon, which has a very popular swimming area – if you don’t mind some cold water. The hot springs and geysers upstream temper the icy water somewhat. Farther north is Norris Geyser Basin, home of the world’s largest geyser. 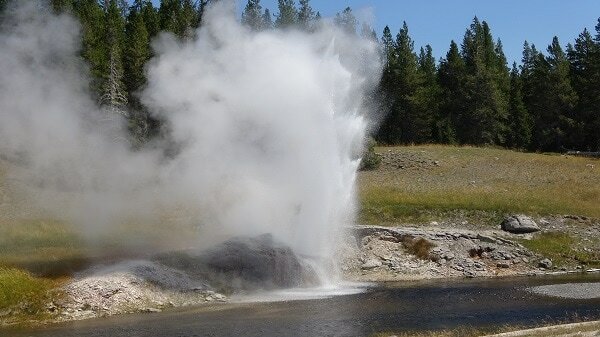 Steamboat Geyser is wildly unpredictable, erupting over 400 feet in its infrequent explosions. It can erupt several times a year – or can go dormant for years. 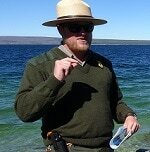 On the east side of the Park, Yellowstone Lake is a hub for fishing, boating, and sightseeing. Two marinas give boaters access to this massive mountain lake. 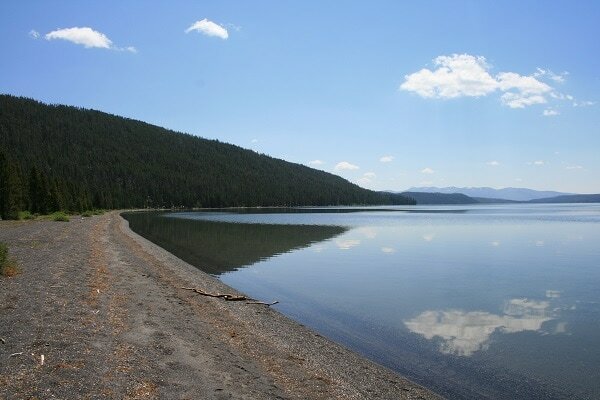 The lake is 15 miles wide by 20 miles long at its widest and longest points, and is the largest lake above 7,000 feet elevation in North America. Some of the remote fingers of The Lake are off limits to motorized craft, but most of it – including an island with a 100-year-old steamship wreck still visible to boaters – is accessible by motorboats. One small geyser basin is found on the extreme west end of the lake. The Yellowstone River flows north, out of the lake and into a broad, open area of meadows known as Hayden Valley. Hayden Valley is a summer paradise for bison, deer, elk, and – in its more remote corners – grizzly, black bear, and the occasional wolf pack. During August of 2016, any drive across Hayden Valley was sure to be delayed by a herd or two of bison just hanging out on and around the highway. These huge bovines are generally mild and laid-back by nature – right up to the point where they are ready to charge and stomp into mush anything or anyone who has irritated them. The average adult bison – usually called buffalo – averages a little less than a ton in shaggy weight. North of Hayden Valley, the Yellowstone River flows through the Grand Canyon of the Yellowstone: A canyon so picture-postcard-perfect that it almost seems unreal when you are there looking at it. Artist Point, on the south rim of the canyon, is our favorite viewing area. 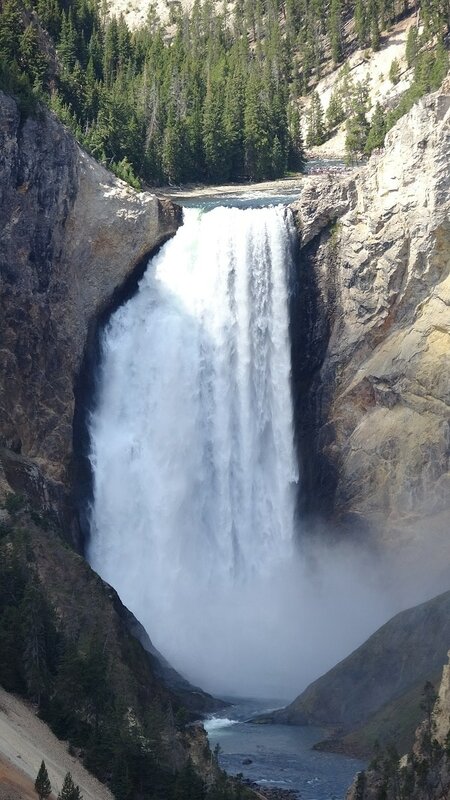 The Yellowstone River tumbles over two waterfalls entering the canyon, the Upper Falls (109 feet) and the showpiece Lower Falls (308 feet). 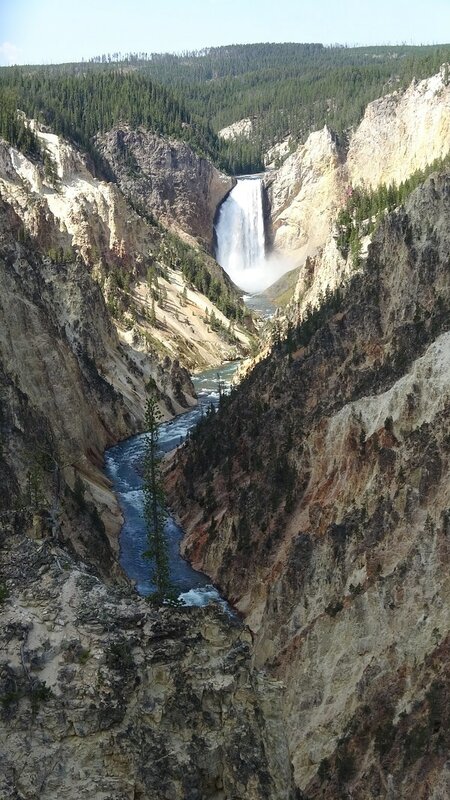 The Canyon itself is around 1,000 feet deep, and – fitting for Yellowstone – does have numerous hot springs near the river in the base of the canyon. Continuing north from the Canyon area, you will drive over Dunraven Pass, and arrive at the Tower Falls area. A short trail leads to an overlook of Tower Falls. Near Tower Falls is Roosevelt Lodge, the Park’s Old West area. Teddy Roosevelt was an early fan of the park, and this area features rustic accommodations, stagecoach cookouts, and horseback excursions. In general, elk and deer tend to hang around wooded areas more, and moose like waterlogged areas. You can generally find wolves by looking for the hard-core wolf watchers. Wolf watchers are easy to spot, since they usually are watching wolves through telescopes suitable for finding new galaxies near the edge of the universe. Wolves seem to hang around the Lamar Valley area a lot, up in the northeastern section of the park. Some are seen in the more remote areas of Hayden Valley. 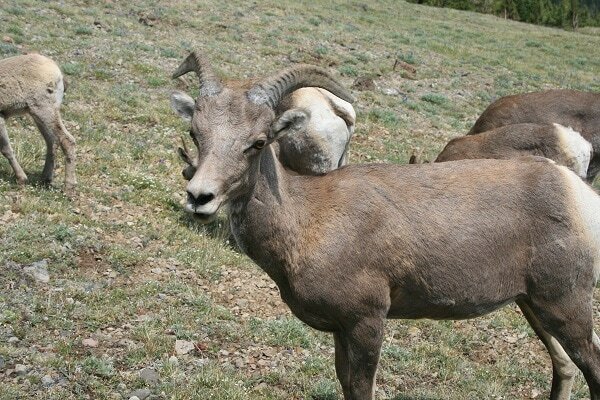 Bighorn Sheep are often seen along the Dunraven Pass area. Bears are, well, wherever they want to be. Yellowstone is a sprawling, intensely entertaining park. Between the natural wonders, the scenery, the wilderness, the history, there is something for almost everyone.